Bavaria has collected in its territory so many priceless historical and cultural monuments, which today the German government takes diligent care. When traveling through Franconia, northern Bavaria, be sure to visit the Seehof Castle. Located only five kilometers from the pretty town of Bamberg in Memmelsdorf, Seehof presents very interesting views and things that can delight its visitors. 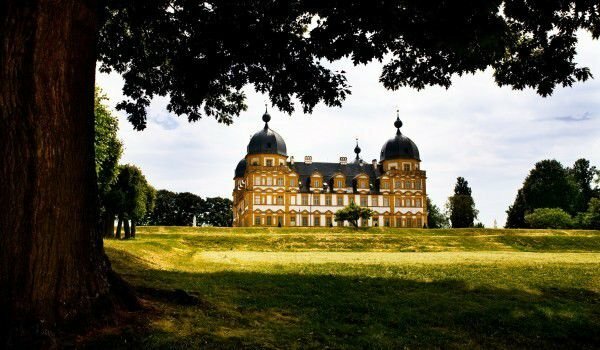 Seehof Castle rises beautifully on the edge of the town and you just can not go wrong with its distinctive four domed towers located in the four corners of the structure. Seehof Castle is one of thethree summer residences of the prince bishops of Wurzburg and Bamberg. The baroque structure of Seehof was constructed in the 17th century. It is also known as Schloss Merquardsburg, but Seehof is its more popular name. In 1686 the palace was completed as a summer residence and hunting lodge of Prince-Bishop of Bamberg and Marquard Sebastian Schenk von Stauffenberg. The chief architect of Seehof was Antonio Petrini. Extensive gardens, beautiful fountains and sculptures have been designed in the following centuries during the other bishops. After secularization, the castle was a private property and gradually fell into disrepair. This is the period between the 19th and early 20th century, and in those years the authentic original furniture was sold, and the gardens were almost destroyed due to lack of maintenance. In 1975 the Bavarian government bought the castle, then the whole palace and gardens were completely renovated and restored. The castle was officially open for public visits in 1990. Some of the original furniture and artwork in the palace are organized exhibition exposures and were located and placed on exhibition. First, visitors pass through the conservatory of Seehof which is considered an extension of the original port of Memmelsdorf. The central gate was built in the early 18thcentury of rococo style with white plaster with orange accents. A conservatory was added later to have contained exotic plants, which Prince-Bishop in the winter months had cared for. Part of the conservatory now serves as a museum of the painter Ferdinand Tietz, who worked in the palace and the gardens. Incredible is the beautiful fountain which was made by the master Tiets and located behind the main body of Seehof Palace. It shows Hercules and 12 figures. Construction began in 1760 and in addition there to is built underground sewers, which is a constant source of water for sculpture. Currently, nine rooms of Seehof Castle are available to visitors. Many of them contain original wooden floors, arranged in interesting geometric patterns. In the ballroom, also known as the White Hall you can see a beautiful mural on the ceiling, painted by Guiseppe Appiani. All rooms in Seehof Palace are restored to their original form from the 17th and 18th century. Everywhere you can see furniture, lamps and chandeliers, paintings, statuary and other works of art from different historical stages.